Newly Revised and Updated! I know this title is a mouthful. But it says what this post is all about. I’ve been working on some ideas for a solo section in a song where the band plays a vamp in 6/8 and I get to solo over it. The tempo is about 160 bpm. And I want to be able to SHRED this. The way to shred at this tempo–IMHO–is to play 16th based ideas. Note that when you play in 6/8, 16th note ideas actually sound like 32nds! Some of the kinds of ideas that sound good to me–kind of Vinnie-ish–are included on this PDF–which, as of this new publication date, I’ve updated. Why the update? I went into the practice room and was practicing the original worksheet and i discovered ideas and ways of putting these together that I thought were easier to play and that sounded better. So why wouldn’t I share that with you? Right! Of course I would! Generally speaking, these ideas are based in paradiddles. You’ll see both inverted and regular single paradiddles here as well as some singles with accents. But there are also some great hand/foot combos involving the toms that interact with the snare in order to form cool phrases. And, I believe this all RIPS. 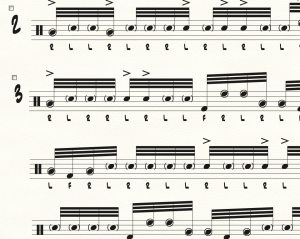 The PDF I’m offering you in this post includes my favorite of these solo ideas so far, written out note-for-note in rhythmic notation, including suggested stickings. You may find this useful even beyond the learning of the vocabulary because it’s in 6/8. I don’t know about you, but part of the growth in my playing around these exercises involves getting comfortable playing with freedom in 6/8. Have you ever shredded in 6/8? I bet a lot of you have not. This should help you in the 6/8 department. There are five exercises plus a new bonus 6th exercise on the PDF; most are one measure, all in 6/8. But feel free to mix up the ideas. It’s important to move ideas around in the bar and connect different phrases to each other in order to get comfortable with this vocabulary. So, get loose with it after you can actually play it. I hope you have fun with this stuff. Not for beginners!